Real working steam locos are becoming very hard to find, even in China, but two of the remaining operations are still exceptionally good. 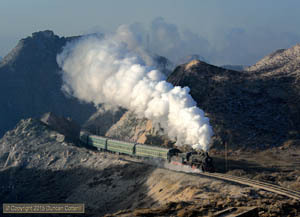 This report covers a 3 week trip based around visits to the steam worked mining railways at Fuxin and Sandaoling in November and December 2015. The mining line at Pingzhuang and Fushun’s Old Steelworks were also visited, with mixed results. 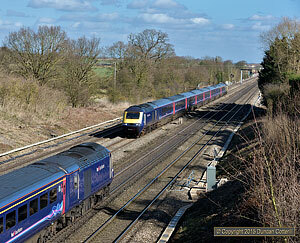 The report includes observations on the main line, all diesel or electric these days. The final batch of photos from my early autumn trips to Germany have been added to the new German photo galleries. These include 34 pictures covering the visit to the Harz Mountains to photograph steam on the metre gauge lines of the Harzer Schmalspurbahnen. 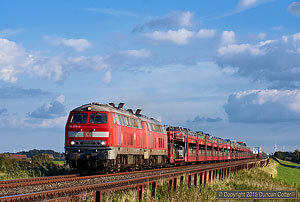 There are also a few pictures from Hamburg, mainly S-Bahn EMUs but with a few locos as well, and one from Hannover. 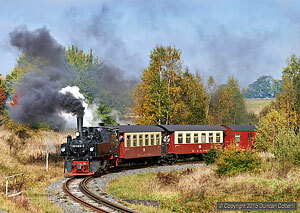 Harzer Schmalspurbahnen operates a 140km network of metre gauge lines in the Harz Mountains, close to the former East-West German border, and uses steam locos on many trains, including the frequent services to the summit of the Brocken, the highest mountain in northern Germany. The railway became a magnet for tourists when the border between the two Germanys re-opened but, unlike many tourist operations, it still has the feel of a working railway. This report covers a seven day trip to the railway in October 2015 and also includes a lot of historical background information as well as details of what we saw during the trip. This report covers short visits to Hamburg and Hannover during September and October 2015. 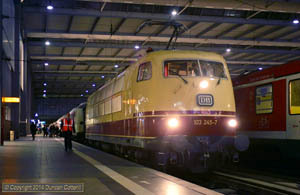 Hamburg still has a lot of loco hauled regional services, many of them worked by class 112 and 143 electrics, classes that are falling victim to the flood of new EMUs elsewhere. There’s less of passenger interest around Hannover, although the class 111 worked Braunschweig - Rheine trains are worth seeing. 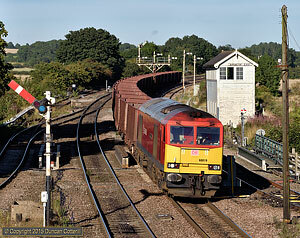 I had intended concentrating on the freights but poor weather caused a change of plan. 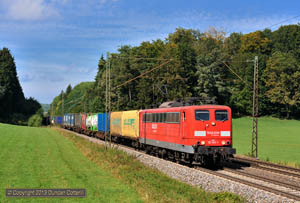 During visits to the Marschbahn for diverted freights in the summers of 2014 and 2015 it became apparent that there was considerable photographic potential west of Niebüll, on the section of line that didn’t host any diverted freights. This report describes a ten day visit to the incredibly busy and entirely loco worked Niebüll - Westerland line in late September 2015. 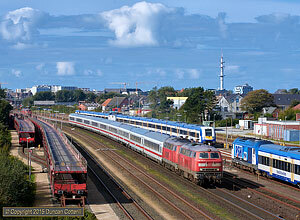 In addition to regional and InterCity passenger trains, the line is home to the SyltShuttle, a frequent service of car carrying trains linking the island of Sylt with the mainland. Over 60 new images from my September 2015 trip to the Marschbahn have been added to the German photo galleries. The trip concentrated on the busy line between Niebüll and Westerland with its frequent class 218 hauled SyltShuttle car-carriers, loco hauled Nord-Ostseebahn regional passengers and a few 218 hauled InterCity workings as well. Another big transfer of pictures to the new php web galleries, bringing the total number of German photos there to over 700, with quite a few images that haven’t been published before. 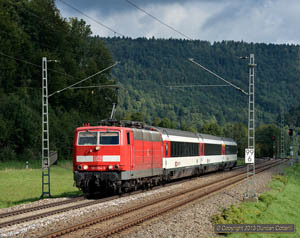 Galleries transferred include most of those from northern and eastern Bayern including the diesel worked lines north and east of Nürnberg and in the Mühldorf area. The busy electrified Aschaffenburg - Würzburg line is also included and there are new galleries for classes 152, 155, 182, 215/225, 217 and 610. A rare excursion to another part of the UK to photograph trains produced these pictures of Barnetby and the surrounding area, all taken on 10 September this year. With plenty of freight trains and some nice locations including Barnetby Station and Wrawby Junction, complete with semaphore signals, it was a very rewarding day out. Another 130 pictures have been added to the new format German photo galleries including a number that haven’t been been published before. 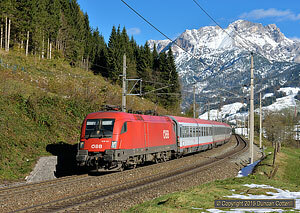 The new galleries now include all the pictures from Baden-Württemberg, leaving only those from Bayern to be moved. There are also eight new galleries covering classes 110/113/115, 120, 146, 151, 181, 424-426, 611 and 650, accessible via the index page. 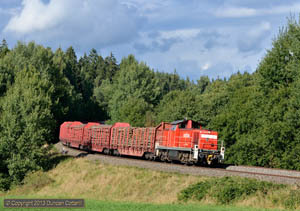 More than 30 new pictures have been added to the German photo galleries, mainly from my July 2015 visit to see the Marschbahn freight diversions. The galleries for northern and central Germany, everywhere except Baden-Württemberg and Bayern, are now available in the new php format with more options for viewing the pictures. The remaining German pictures, over 500 of them, will be moved when time permits. The Danish photo galleries have been updated with photos from the recent freight diversions between Fredericia and Hamburg. The opportunity has also been taken to convert them to the new format. After really enjoying the Marschbahn freight diversions in July 2014, I couldn’t resist going back when the process was repeated in July 2015. 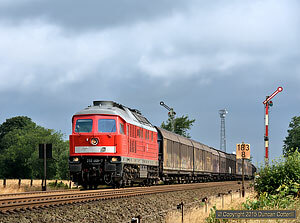 As before, it was a rewarding experience with Ludmilla’s and MZs on the freights and plenty of 218s on Sylt Shuttles and ICs. 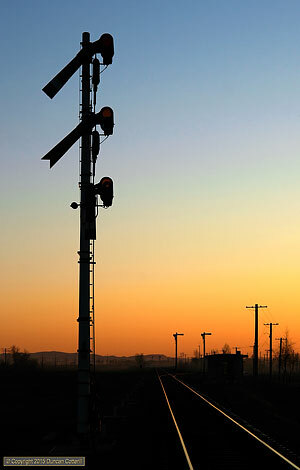 Add big MAKs, semaphore signals and sunshine to complete the experience. Read the report here. The UK photo galleries are the first to benefit from the new style galleries and a good number of new pictures have been added, some from the early 1980s around Yorkshire and others from 2003 in the Thames Valley. In April I wrote about how the rails had been pulled out from beneath my photo workflow, making it very difficult to continue publishing photos in the way I had become used to and was very comfortable with. At the same time the Austrian galleries were republished using an experimental PHP based web page using data stored in a Filemaker database. The intention was to tie up a few loose ends and then go to work on converting everything to the new system. As with many things computer related, getting it to work reliably and consistently turned out to be much more complicated than it looked and the project took a lot longer than I’d hoped. The other big delay was the realisation that there was plenty of scope for improving the way the galleries worked. It was back to square one, requiring a complete rewrite of the code to produce all the new pages and keep them linked in a logical manner. Well it’s finally up and running and the first new galleries are online. The biggest difference is that there are many more options for viewing photos, not just on a line by line basis. You can now select which pictures to view based on other criteria, such as the type of train or the class of loco as well. The new photo gallery pages are stretchable sideways so you can view more thumbnails at the same time on a bigger screen without scrolling. There’s also the new slide bar at the bottom of each photo page with links to the next few and previous few images to make navigation easier. Hope you enjoy the new format. 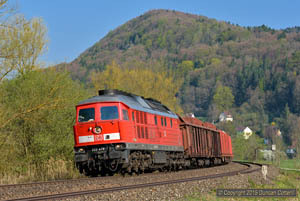 The Schwarzach-St Veit - Wörgl line is a very scenic east-west link between the Vorarlberg and Tirol and the rest of Austria but most expresses and some freights normally take the shorter, faster, “Korridor” route via Rosenheim in Germany. These photos were taken in the autumn of 2014 when the Korridor was closed for engineering work and everything went through the mountains. Just over a year ago I wrote about how new technology was being used to automate the production of Railography photo galleries, only to find the whole process starting to derail less than twelve months later. Apple announced that their Aperture photo library app had hit the buffers and wasn’t going to be updated. No problem at the moment but it’s likely that it’ll stop working with some future version of the operating system. The whole thing came off the rails when the RapidAlbum plugin for Rapidweaver stopped working with the latest version of the program and it became apparent that it wasn’t going to be updated either. What made both Aperture and RapidAlbum special was the way they made use of the data contained within an image file, making it easy to find individual pics in a library of many tens of thousands of files in one case and using that data to produce whole web galleries by simply selecting a folder of image files in the other. Titles, captions, technical details and everything else was included in the file metadata and went everywhere the image went. A search for alternative software with similar capabilities revealed nothing suitable. Instead of embedding the relevant data in the photos, why not embed the photos in the data? A few weeks development and the result is a Filemaker Pro database where the photos, details, captions etc are all brought together and then exported to the website. The galleries themselves have been simplified by the use of PHP code, which creates the individual pages on the fly using the photos and data supplied. For now it all looks the same but the scope for improving the functionality of the site is considerable. To prove the concept, the Austrian photo galleries have been republished using the new process. Look out for more improvements over the coming months. Any problems with the new pages, please let me know - they should work with almost any reasonably up-to-date browser as the PHP works on the server and the code your computer or tablet sees looks much the same as any other pages on the site. I gave up on photography in the UK in 2003, disillusioned by the virtual extinction of loco hauled passenger and mail trains and the replacement of interesting freight diesels by the ubiquitous class 66s. There was far more worthwhile stuff to photograph in Europe. Eleven years on, and with electrification looming, I went back to the Thames Valley to record the scene before the poles went up. This gallery contains a few images from 2003 and more from 2014 and 2015. 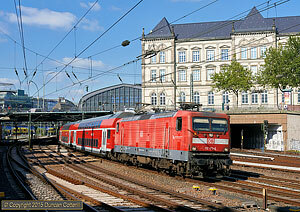 A couple of minor updates to the Nürnberg - Schwandorf (1 new photo) and München Hbf (4 new photos) galleries. The latest photo gallery added covers the Südbahn, the double track diesel worked line from Ulm to Friedrichshafen via Biberach and Ravensburg. Some services are worked by DMUs but there are plenty of class 218 diesels on passengers and the occasional 232 or 294 on freight as well. I’d ignored this line for years in the mistaken belief that it was flat and uninteresting but there are some very nice locations on the southern half of the line as I hope these pictures show. Two new photo galleries added, covering the Stuttgart - Ulm and Rottweil - Villingen lines in Baden-Württemberg. 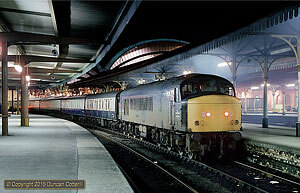 The former is a busy electrified main line carrying a wide variety of traffic, worked by a wide variety of traction. The nine pictures, showing eight different classes were all taken on the same afternoon and barely cover half the number of different loco types seen. Rottweil - Villingen is a backwater by comparison, largely worked by DMUs but with the occasional 218 appearing at weekends. More photos from Baiyin, this time from the China Rail Baiyinxi - Honghui branch that crosses the mineral railway just outside the town. 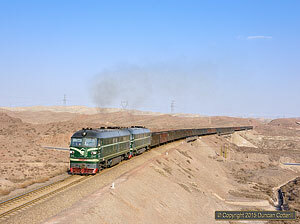 The line runs through a barren desert landscape and carries a lot of coal traffic from the mines around Changzheng. 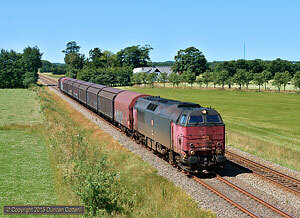 In 2009 the line still used the DF4Bs that took over from steam in the 1990s but by 2014 DF8Bs had taken over. 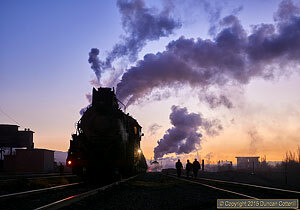 The Baiyin photo galleries have been updated with an additional 34 pictures from three trips in 2009, 2010 and 2014, showing steam and diesel locomotives on freight and passenger trains on this interesting industrial system in western China. The long process of bringing the photo galleries up to date continues with 11 more pics from a very successful visit to the Nürnberg - Hof line in north-eastern Bavaria in April 2013. 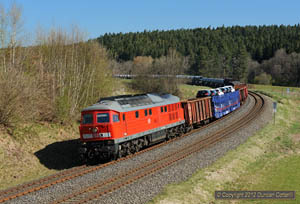 The attraction was the use of class 232 and 233 diesels on a handful of freights every day, all running through the glorious landscape of the Fränkische Alb and the Fichtelgebirge. 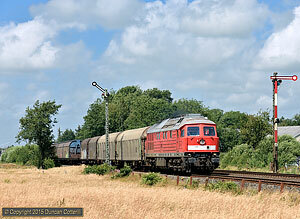 Half a dozen pictures from the Regensburg - Marktredwitz line in north-east Bayern taken on two visits in 2013. This was a major route linking München with Berlin, Leipzig and Dresden until the partition of Germany reduced its importance. Although it no longer sees long distance expresses there are still some loco hauled passengers, operated by ALEX, and a few freights.